Geraint Lewis was born in Cardiff in 1958 and educated at St John’s College, Cambridge. On graduating he was appointed to the music staff of the University of Wales at Bangor, working with Professor William Mathias. He has worked on the music staff of BBC Wales and is now Artistic Director of the Nimbus Foundation. Lewis has published extensively on the composer Tippett and holds a number of important artistic positions. He is Artistic Director of the North Wales International Music Festival, a member of the Arts Council of Wales and Chairman of the Arts Council of Wales Music Panel. 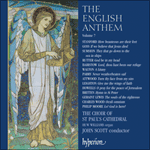 This work was suggested by a request from Nina Walker for an All Souls’ anthem for 1992. I started work before Christmas 1991 and showed the part that I had completed to William Mathias during one of my many visits to see him in Anglesey. He liked what he heard and urged me to complete it. I held back however and put it to one side. A month later Mathias was diagnosed as having terminal cancer and given six months to live. I visited him every other week during this time (travelling from Monmouth to Menai Bridge) and he died on 29 July 1992. During this time we put his manuscript in order and tidied up his catalogue and I helped him with his last works. We then planned a Service of Thanksgiving for his life and works in St Paul’s Cathedral. John Scott suggested that I write a work for the service (which otherwise consisted entirely of Mathias’s music—much of it with St Paul’s connections) and so I went back to my setting of The souls of the righteous and completed it as a tribute to my closest friend and colleague. The text is from Wisdom and is variously a collect for All Saints—eve of All Souls. Mathias was born on 1 November 1945—All Saints’ Day—and All Souls’ Day is 2 November. It has been widely performed by many choirs in Wales and England, and as far away as South Africa and Norway. And the pain of death shall not touch them. They seemed to perish, but they are in peace.